Historically IT asset management (ITAM) and IT service management (ITSM) have been managed as separate entities with separate teams and unconnected objectives. In reality they are highly dependent upon each other with intersecting processes and shared data. When processes, data and tools are combined, they bring considerable benefits - reflecting that the whole is considerably more effective than the sum of the parts. Ian Aitchison, ITSM&ITAM Product Director will explore the synergies between ITAM and ITSM, and the benefits an organisation can achieve with greater visibility into the assets that make up its business services. Why have so many organizations delayed, failed or neglected all together to implement a proper configuration management strategy? Frankly, it's just plain hard. In this bright talk we will walk you through how to approach a Configuration Management implementation, how to sell it as a business project and not an IT project, and what mistakes to avoid to establish an initial working phase that you can build on for success. All facets of the business demand innovation from IT, but preparing for it requires scope, timing, vision, understanding the competitive landscape, and innovative business processes. This will require new roles, new approaches to funding special projects, value-based metrics, and controls to ensure that the shifts aren't seismic. In this session we'll look at examples of businesses that used big data and analytics, mobile, social media, IoT, or other disruptive technologies to revolutionize their business model, and we'll provide steps that can assist your journey. Organizations must create efficiencies, increase velocity, and at the same time reduce risk in their IT services. 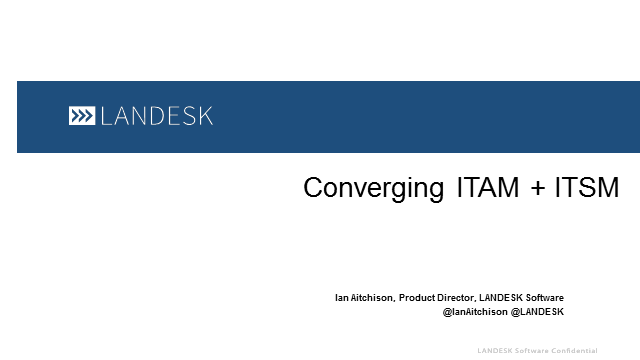 LANDESKs ITSM Evangelist, Matt Hooper, will breakdown the differences between a DevOps ITSM approach & ITIL ITSM approach in the areas of People, Process, Technology & Suppliers. Using scenarios, we will compare the two approaches and discuss the pros & cons of each. DevOps, ShadowIT, cloud and other disruptive movements mean that IT in 2020 will bear little resemblance to IT as we currently know it. The skills of the ITSM professional is also going to drastically change over the next 5 years. Will you be ready? This webinar describes the critical skills gap developing, and what opportunities this offers ITSM professionals in 2020. Join Patricia Adams, ITAM Evangelist, for this live one-hour webinar to learn how you can transform or refine your approach to increasing ITAM maturity. During the webinar we will provide characteristics of ITAM/SAM maturity from a people, process, and technology and business impact perspective. Learn how you can improve your IT Service Management solution by adding or upgrading the self-service portal. Understand how three ITSM components will improve productivity while reducing ITSM costs in addition to creating a better customer experience. In this session, we will discuss how Knowledge, Automation, and Asset Management are key ingredients to providing efficient request fulfillment from a self-service portal. Best practices for designing, improving, delivering, and managing IT Service Management (ITSM) solutions are typically defined by the ITIL framework. Most ITSM solutions can be designed to meet ITIL recommendations; however, many organizations are still struggling to follow ITIL processes. This session will discuss best practices for adopting ITIL processes into an ITSM solution. The business trust in IT starts in how it sees IT lead the evolution toward digital systems. If your Self-Service Catalog is simply a listing of information with a basic request portal, adoption and reputation are at risk. ITSM Expert Matt Hooper will discusses how modern self-service systems are focused on creating a delightful user-experience. How the under-pinnings of this experience must leverage modern digital transformation techniques, in order to be truly transformative to how the organization works faster, increases knowledge sharing, and leverages human performance to drive business performance. Both IT and software asset management are heavily process dependent. To prepare for an ITAM implementation it is important to have the basic policies and lifecycle processes in place in order to ensure the success of your ITAM program. In this presentation, will cover the necessary IT and end user policies for hardware and software asset management, and the lifecycle processes needed to manage both clients and servers. In this session, Ian Aitchison (ITSM Product Director) describes how a fresh approach to Knowledge Management in your ITSM operations can make a dramatic difference to all areas of IT service and support, positively impact business productivity, and ultimately transform your Servicedesk staff from Overwhelmed Overloaded Sufferers to Proactive Business Experts. Governance has traditionally been viewed as a roadblock, controlling and slowing down innovation. However, some enterprises are using governance to increase speed and velocity. How can governance create agility? How does Service Management remove constraints? What role does DevOps play in governance and Service Management? Join us for this informative discussion to learn how lean Service Management practices along with DevOps cultural changes can enable Enterprise level Agility within your organization. Learn how to implement ITSM into your organization with success, with ITSM expert Matt Hooper. Learn how to position executive management support for your improvement initiative. Understand how to establish a culture of change adoption, that will enable you organization to improve their effectiveness. Lay a foundation of ITSM processes that will demonstrate real results and build momentum for your continual improvement roadmap. IT departments are challenged with maintaining systems while being charged with innovating to help their organisational productivity. Maybe you want to re-position IT as an innovative, changing and improving force but just can’t make it happen. In this webinar, we will address the challenges to introducing IT innovation in an organisation. Then using a number of real world examples, we will lay out a range of business and technology integration techniques and approaches proven to foster continual user centered service improvement. Subjects covered include: The IT Innovators Dilemma, Why ITIL Can’t Innovate, The Upgrade Fail, The UBER technique, Building an Innovation Machine, Pizza and Agile Improvement, and Gamification of Ideation.